The Alpha Canine Centre has cooling and is fully enclosed, so training will be on regardless of the weather - come along to escape the weather. Training does not run on Sundays when they fall on a long weekend. Refer to page 2 of the Pack News newsletter for all important dates including days off due to long weekends. Every year we take a break over summer. Our last session for the year will be Wednesday 5 December 2018. We will return to training on Sunday 6 January 2019. In the event that classes are cancelled, there will always be a note on the Alpha Canine Group Facebook page. Pioneers of the "Lifestyle" obedience training concept! 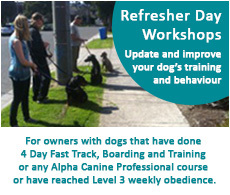 Alpha Dog Training prides itself on the development of teaching and training innovations that are all driven by a genuine motivation to produce realistic and lasting results for our customers in obedience training, socialisation/confidence and behavioural problem solving. 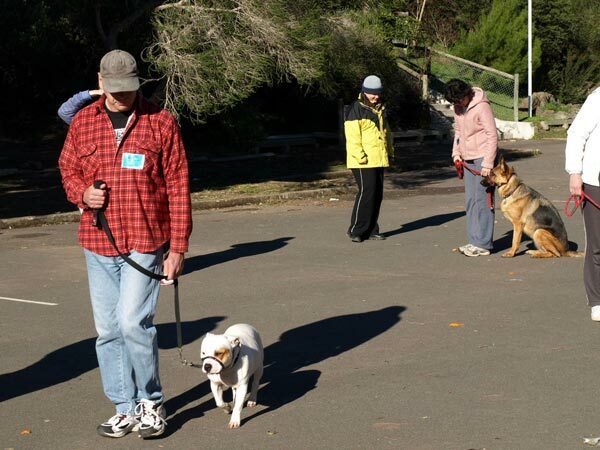 Take your time and thoroughly explore what our dog training business has to offer you and see why so many vets, dog groomers and other industry professionals from all over Melbourne are referring dog owners to Alpha Dog Training. 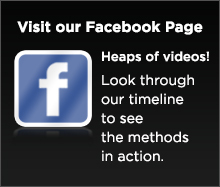 Click the 'Full screen' button in the bottom right corner of each video clip to enlarge the video. 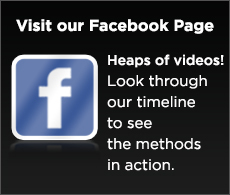 Press Esc to return to our website. Above: Revolutionising the way effective obedience, good behaviour and canine behavioural rehabilitation is taught to owners and their dogs under realistic distraction and in group training scenarios! Above: Canine rehabilitation begins with effective methods and modern, relevant behavioural and learning theory. 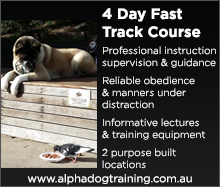 Alpha Dog Training has both and can show positive results such as those seen on this video at any time - we do this week in, week out. 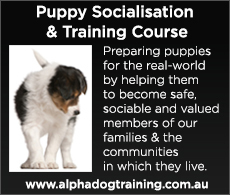 At Alpha Dog Training we are extremely proud of our flexible, value for money service that when put into total perspective of exactly what you are getting in your membership, just can't be matched anywhere else. 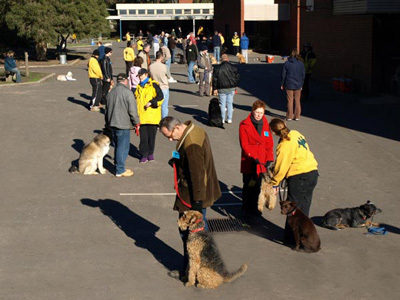 There are so many exciting aspects to our Lifestyle Canine Communication System, but what really stands out is how we are able to include effective, reward based obedience training (to advanced "off-lead" levels), socialisation and distraction training and access to effective behavioural modification advice as part of every - single - training - session. This random photo of an actual training session shows the interactive teaching process in full swing – instructors wear a distinctive black and gold uniform so they can be easily seen – ready to help at all times! These training "essentials" are not added extras and they are in no way the limit of our service. Add to all this class structures that allow a personal and interactive service even in groups, the ability to be assessed for graduation to the next obedience level at any training session and proven strategies to teach you effective and confident (real life) handling under distraction. There is so much depth to Alpha's quality of service, all you have to do is come and see it all first hand. Alpha's first FREE session and guided tour is a no obligation service that allows you to experience everything we do in real-time. Take in the atmosphere, admire all the well trained dogs at different levels (so many different breeds), meet our friendly and professional training staff, and most importantly... Try before you buy! There's no sell, sell, sell – just an informative session where all your questions are answered and the service is on full display and explained in detail. 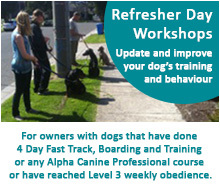 If you do actually decide to join Alpha Dog Training, substantial discounts are available for joining at the end of your first FREE session! 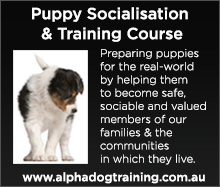 There is just so much to show and tell you about Alpha Dog Training, so cruise around the website and learn more about our services. You are welcome to contact us for a detailed information package covering our services and pricing or complete our online form to request a detailed information booklet as a PDF. As good as it all looks and sounds – nothing beats seeing it in action. The Alpha Dog Training Difference! © Copyright Greg Fontana, Training Director, The Alpha Canine Group 2013. Creativity by Ladybug®.